The success of each shot taken, given first the skaters and goaltenders, and if possible, the playmakers and defenders. This is what we’re getting at when we try to measure talent; if the situation repeated itself, with the same conditions, what kind of an outcome would we be most likely to see. The distinct thing about this is that the proof of the pudding is in the eating: it doesn’t really matter to people how you cooked up your estimates, because credibility is earned by being right more often in the long run. 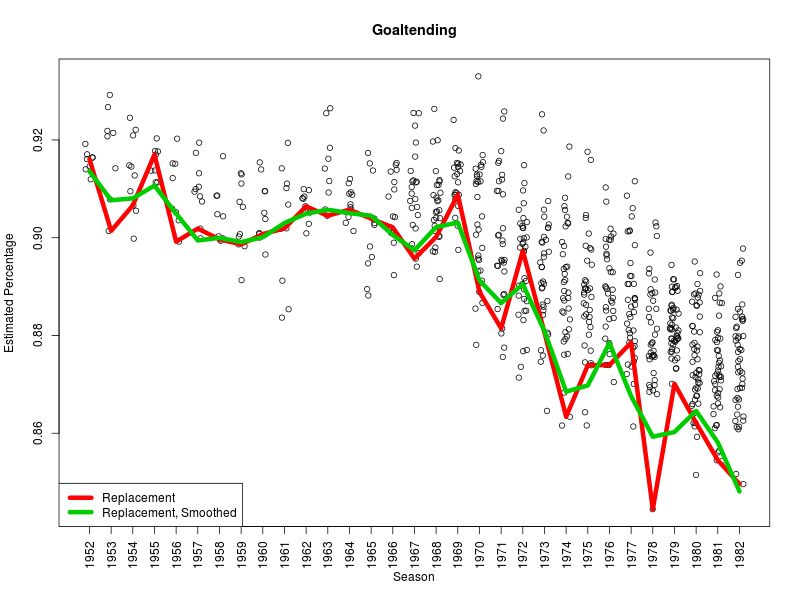 First, we use the Poor Man’s Replacement to mark all shooters with less than 30 shots in a season, and goaltenders facing fewer than 300 shots, as the players whose joint results are our gauge for replacement-value talent. 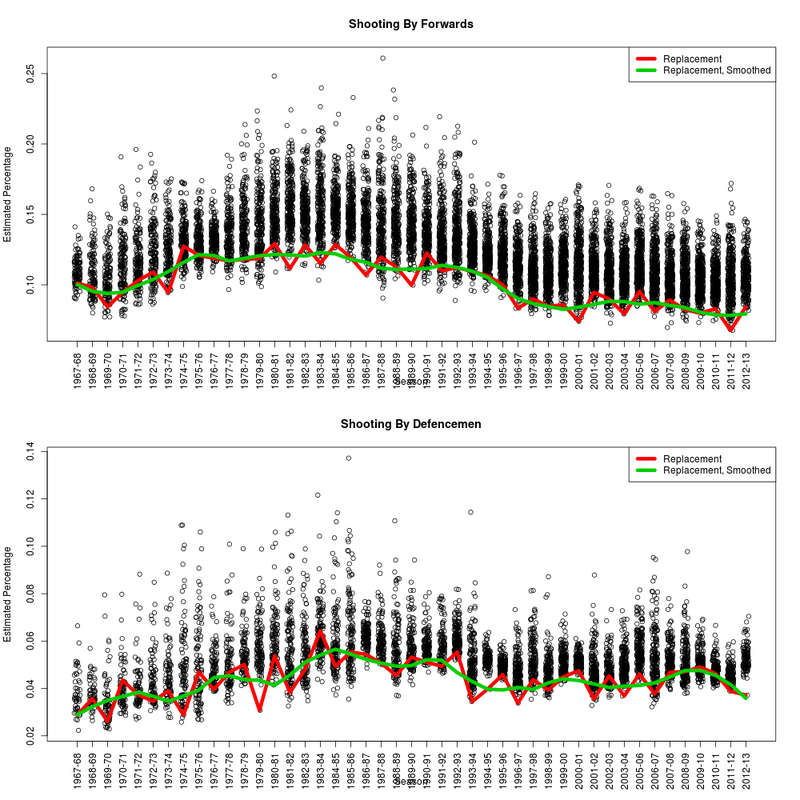 We then run these through a binomial model where results are shrunken toward a common mean in each year; the more shots each player has, the closer the result is to the observed shooting percentage. The original estimates of replacement value are a little noisy from year-to-year, so we use a loess smoother to establish an “expected” replacement value over time. Editor’s Note: This post was written by Emmanuel Perry (@MannyElk) and Ryan Stimson (@RK_Stimp) to describe their crowdsourced projects. We are happy to partner with them to help join their data back to our database, not just to spare them to extra work of linking back to the standard set, but to make it easy on them so that it can all be shared publicly. EP: While listening to a particularly riveting episode of TSN Hockey Analytics featuring one co-webmaster of the site you’re currently reading this on, I heard something that piqued my interest. Andrew Thomas stated his openness to hosting fan-sourced data on the site and went on to mention he had begun working with Ryan Stimson to try and make this happen. I was already aware of Stimson’s Passing Project and was excited at the prospect of having such unique and valuable information shared publicly on an established online platform. I myself had been involved with collecting and sharing manually-tracked data of a different type, but had not considered expanding this project until now. As the hockey analytics community gathers more information on how goals are scored, there’s been an emphasis on pre-shot movement and passing. Steve Valiquette introduced the concept of the Royal Road. The link Manny provided in the opening paragraph discusses the fact that teams shoot at a higher percentage as the number of passes preceding the shot attempt increase. The focus of this project is on capturing what happens prior to the shot attempt in several forms: sequence (one pass, two passes? ), location (offensive zone passes, transition passes, Royal Road passes? ), and efficiency (which players generate shots more often than others?). As we’ve gathered data on 340 games from this season alone, I’m more confident than ever in saying that what happens before the shot is attempted matters significantly more than where the shot is taken. Our goal is to collaboratively record all blue line events during the 2015-2016 NHL season. In addition to zone entries, all instances of the puck entering or exiting a zone will be recorded. Thus, the location of the puck is known at any given second, allowing us to extrapolate stats dealing with zone time or transitions. In particular, these stats bring us closer to identifying specific aspects of the game on which players can have a direct positive or negative impact. I outlined potential applications of this data in my presentation at the hockey analytics conference at Carleton University in Ottawa, which you can listen to here. Since Ryan’s project was initially proposed, he’s received significant interest and has accrued a handful of volunteers. In the few weeks since I proposed mine, I’ve gotten similar interest for which I am very grateful. In order for these missions to come to completion, however, I regret to say we’ll need more help. If you’re interested in contributing towards what we both firmly believe is a hugely important movement in the field of hockey analytics, please contact* either of us and we’ll be happy to provide additional details. EP&RS: In addition to recruiting volunteers, Ryan and I have opened a crowd-funding campaign that you can view here. The money we raise will be put towards GameCenter Live subscriptions for our trackers and compensating Andrew and Sam for the time and effort they will dedicate to processing and hosting this data. [Ed: We'll use it to pay for the server costs. -AT] Know that your donations will go a long way in helping this latent information travel from the ice surface to your computer screen. This entry was posted in Uncategorized on February 25, 2015 by @acthomasca. Assessing the coaching staff’s deployment (“usage”) of a player. The main two of these are based on all shot attempts (Corsi) and the amount of time these players spend on the ice (since, oddly enough, better players are used more.) Both of these are useful for their purpose, but both are better served by having a summary quantity of these that are predictive of future behaviour, since they reflect both a locally accurate version of player ability and the state of the coaching staff’s current information. to update the game prediction for TOI60. To calculate the teammate and competition statistics for that game, we then take the average of each player’s teammates (and opponents) weighed by the amount of common ice time, as before. In addition, we’ll be adding the exponentially weighted statistics to our player, team and goaltender history once we establish the best predictive measure for each. This entry was posted in Uncategorized on February 20, 2015 by @acthomasca. We had fun talking with all of them, but we’re just as curious as you all are about the new interface coming out tomorrow. This entry was posted in Uncategorized on February 19, 2015 by @acthomasca. Thanks to Dan Kingerski from 93.7 The Fan for promoting the site and having Sam on the show. Listen to Sam’s interview here. This entry was posted in Uncategorized on February 12, 2015 by @stat_sam. Alexandra Mandrycky (@alexgoogs) has been utterly indispensable in the assembly of the war-on-ice.com player contracts database, and has also been developing upgrades to our charts, which will not only make them more usable and more pleasant, but will also speed up loading time and allow for additional portability. We can’t say enough good things about her contributions to the site so far. Ryan Stimson (@RK_Stimp) is fronting a group of manual trackers as the leader of the Passing Project, who are collecting information on “pass assists” and other pre-shot information. Included in this is the tracking of passes across the line Steve Valiquette has coined the Royal Road, which we will of course think of instead as the Highway to the Danger Zone. Thanks to these folks for everything they’re doing and will continue to do with us. Give them a follow and help them out if they ask, because they’re making our lives considerably easier and the site all the better for it. This entry was posted in Uncategorized on February 3, 2015 by @acthomasca. After some consultation, we’ve got a definition of “scoring chance” that is a reasonable one going forward. We’ve deployed it into our site tables for players and teams to test it out. Rebounds: Any shot that follows within 3 seconds of a blocked, missed or saved shot. 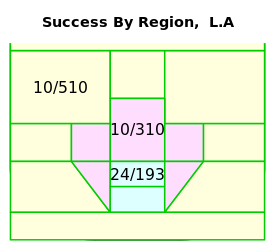 All have measurably higher probabilities of success in each of the three zones. Rush shots: Any shot that follows within 4 seconds of any event in the shooting team’s neutral or offensive zones. This is based on David Johnson‘s definition, but the four second threshold gave general and statistically significant increases in probability. This entry was posted in Uncategorized on December 31, 2014 by @acthomasca. At #PGHAnalytics on Saturday, there was a short discussion about uncertainty in metrics such as Corsi% and Fenwick%. How can we quantify this uncertainty / variability? The simplest way to do this would be to include standard errors with each player rating such as Corsi% or Fenwick%, which is a good start. What else can we do? After the jump, we introduce a graphical approach to comparing pairs of players, looking at the distribution of their single-game Corsi%s, Fenwick%s, and much more. This entry was posted in Uncategorized on November 12, 2014 by @stat_sam.